Update 2013-08-20: Here is a bug report I submitted about unclear documentation. A less developer oriented post today. I find there to be an incredible lack of tutorials on how to mail merge in LibreOffice. So I made my own. This tutorial assumes you have an xls or ods file with data you want to “merge” to a document. Then do this instead. The documentation is still rather unclear. You will need to use the Edit, Exchange databases as described below. I’ve also noticed if I try to print directly as the documentation would leave you to believe, it gives me blank pages in between each sheet! To solve this, set up the labels but instead of hitting print, select Tools, Mail Merge Wizard as proceed as described below. Essentially you are still performing a mail merge, except by starting from New, Labels, it will take care of the otherwise complex formatting of a label. Ensure you have proper headers on your spreadsheet and save it. Take note where you save it to! Why is it named exchange database? Some people have one address but not the other. Libreoffice will insert a blank line no matter what. You can get around this by using the “address block” feature but that’s very limited and won’t work for every use case. You can also try making conditional sections but with such difficulty in doing that, you might as well just make your text document in Python. Select starting Document: Select current document. Select document type: In this example we intend to print or save the file so select Letter. Insert address block: Ensure “This document shall contain an address block” is unchecked. Create salutation: Ensure “This document should contain salutation” is unchecked. Edit document: By clicking the left and right arrow we can preview each page. Personalize document: This screen shows us the finished document which is editable. Save, print or send: What do you want to do this the finished document? You may save it, print it, or email it (may require additional setup). Save merged document will save the finished multi page document and Save starting document will save your template for later use. Thanks to Juanito for the comment. You can in fact suppress blank lines (ex address 2) though it’s anything but intuitive. Place the cursor to the left of the field. Overall thoughts? Libreoffice is terrible. A hugely common use case is convoluted. Looks like Office 2010 also requires this conditional paragraph suppression too. The world marches backwards. Thank-you so much! I’ve been trying to perform an MM for the last hour and failing miserably. All I wanted to do was add a personalized salutation to the start of the letter, and the MM Wizard was useless in this regard. (Although it seemed to be letting me create the salutation, it failed to substitute in the database fields.) The OO/LO documentation was not helpful here either. Your method of dragging database fields directly into the document works. Star Office, Open Office and now LibreOffice. Great programs – absolutely crap mail merge. It’s been just as bad for at least 10 years and I don’t know why they don’t fix it. There’s never any decent information available – apart from yours – and the “salutations” block is a sad joke. I’ve worked in many offices and mail merge is a routine job – if this isn’t sorted this freeware will never be able to compete which is a great shame as it’s the only feature holding it back. Hi again – I’ve just tried using your method and it works! Briliant – I very nearly went back to using MS Office yesterday. I’ve emailed the team that develop LibreOffice to see what they have to say. Cool. I think the most frustrating issue is that in some screens you can select an xls file for your source but in others only database files. Wish I had time to hack on Libreoffice code. You may want to add before Step 2: “Open Writer”. Is there a way to merge without the page break between each merged “letter”? tq very much. I did get help reading your tutorial and progressed. May God bless you. You are a lifesaver. Thanks. Thanks — exactly what I was looking for. I note that LibreOffice on a fresh installation of Ubuntu 12.04 will crash without error when selecting “Edit > Exchange Database”. This is due to some missing packages, and can be solved with the below line, which installs the entire LibreOffice package, rather than the minimal version that comes pre-installed on Ubuntu. Currently, I get all the way to sending and then it locks up..
Can you shed some light on this David? Note that if you skip #10, the merged document still hides the blank line (tested on LibO 3.5.7.2), but the preview in the Mail Merge Wizard does not. Can the output be saved as separate files with filenames capturing merge fields? can output be saved in individual files automatically with merged field as filename? Like some other of your readers I had assumed to start at the Mail Merge Wizard, which was hopeless. Your solution, while non-intuitive actually gives me a copmarable result to MS-Word, really easy once you know how ! I found the s/sheet had to be saved in ODF format, not XLSX, maybe some other formats will work too, but xlsx doesn’t seem to. Great job on the post, thanks again. A lot of pulling out my hair trying to figure this out, even with the LibreOffice 4.1 manual. Your tutorial was worked. Thanks so much! VBox – you’ve probably had an answer by now to your query of March 21st, but yes, you can use a mailmerge field as a file name. You should then see a Mail Merge dialog window with a preview of your data at the top and underneath ‘Records’ on the left and ‘Output’ on the right. Under ‘Output’ select ‘File’ and then ‘Save as individual documents’, tick (check) ‘Generate file name from Database’ and then select the field you want to use as a file name. I use a custom field in my spreadsheet comprising a concatenation of two other data fields. The only drawback is that each filename will be suffixed with a 0 before the file extension, but you can remove these manually later if you need to. I am struggling to format numeric merge fields. Even though the spreadsheet data is formatted as currency and I have applied currency to the merge fields in the mail merge template (right click > number format > category Currency > format GBP) the resulting merged documents just display plain numbers and ignoring decimal places. What do I need to do to correct this, please? I just figured this out a second ago…it was driving me bonkers for about an hour. Once you drag the field into place however you normally do it, double click it. In the window that pops up, there’s a radio selection for “From Database” or “User Defined” in the center-bottom. This is BS because the ability to save formats in fields has been broken in Base for a while now. This guide was exactly what I needed — you’ve saved me hours trying to work it out. Many thanks David! A lifesaver! However, after adding fields, merging the document, and saving the starting document for later use, when I reopen the starting document, the field are gone, and all I have is page 1 of my merged document. What am I missing? Just figured out out: if I save the starting file in a template format (.stw), my field are preserved. How I wish for the old Word Perfect mail merge. Thanks for the post! It got me through this UX nightmare. Here’s some things that tripped me up / got me out of trouble. Feel free to incorporate them into your post. As alluded to in other comments if you want to name your files from your data source, don’t use the “mail merge wizard”, it doesn’t support it. 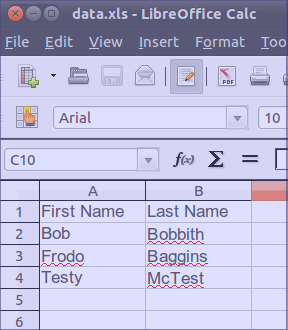 Instead add one or more fields to your document and then hit ‘file – print (ctrl+p)’, it will prompt to do a form letter providing a completely diffierent wizard (go figure), which does support file naming. * ‘edit – fields’. Make of that what you will. * Hit F4 to view the data sources. Thanks for a nice howto. There is one very important thing that is missing in the beginning. You need to check if the database is installed (which for some reason it is not on Ubuntu). If the database is not installed you will get no warning, the only thing you see is that sometimes the howto does not match what you see in the instruction. I do mail merge once a year, and every time I spend an hour to figure it out every year. Then the rest of the howto will work. It’s now September 2015, I’m on LibO Writer 5.0.1.2, and this tutorial is still a life-saver. Thank you! Thank you for straight forward, easy to follow instructions! I was struggling with this especially poorly documented bit of LibreOffice and your article has been a lifesaver. Thank you!